This is in reaction to declining fortunes in the US for Guinness. Volume sales of the Irish stout in North America fell 6 percent in the 12 months ended June 30, reported Guinness maker Diageo, following a 2 percent decline a year earlier. This is not Guinness’s first shot at lightening up for American palates. In 1988 it launched Guinness Gold, but the lager never attracted a following outside a few East Coast markets. “It was outstanding from a taste standpoint and had a strong group of loyalists, but was sort of diverting the focus from the huge opportunities with Guinness,” Guinness Import’s then-chief executive officer told Brandweek in 1993, the year Guinness Gold was discontinued. The problem, execs felt at the time, was that the extension undermined Guinness’s brand equity as “a rich, black beer”. Twenty years later Guinness is rethinking its identity in the US again. It started with Black Lager in 2011, which resulted in a short-lived sales bump. Like other big brewers, Diageo cited competition from craft beers and weak demand in bars and restaurants as reasons for Guinness’s recent sales decline, and hopes the new extensions will refresh interest in the brand. The new Blonde will be made by City Brewing in Latrobe, Pa, using a Guinness yeast from Dublin. It’s on the hoppy side and a touch ‘biscuity,’ Diageo’s director of beer business, Doug Campbell, told Advertising Age. 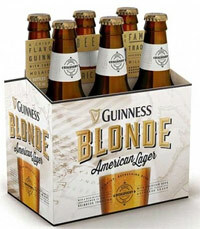 Blonde is expected to be a permanent addition to Guinness’s expanding lineup, although the company’s planned future non-stout offerings may be temporary.